The perfect option for anyone looking for a quality residence. Tiffany Towers residents enjoy the advantage of city living in a quiet and elegant neighbourhood. Whether you are looking for a one bedroom, two bedroom or penthouse suite, you will find Tiffany Towers elegant and appealing. Tiffany Towers offers residents a luxurious lifestyle with so many more conveniences. Each suite at Tiffany Towers features a balcony, floor to ceiling windows, modern appliances, large closets and central air conditioning. Utilities are included and digital TV/High speed internet is available.
" Stefan is amazing "
" Thank you so much for your service "
My parent’s time at Tiffany Towers was great, in no small part by how your commitment to the tenants shines through. My folks were always quick to praise you and your support. Having lived in houses for so many years, it was a great adjustment to apartment living and they settled into Tiffany Tower immediately.
" Tiffany Towers is a nice and well run building "
I am very pleased with my dealings with management. Everything is handled promptly and so well, I really appreciated everything they do.
" A great place to live "
The management is great, our neighbours are very kind and friendly and we’re right across from well-known stores and restaurants.
" To us this is home! " We are happy here. We have a sunny and cozy apartment. 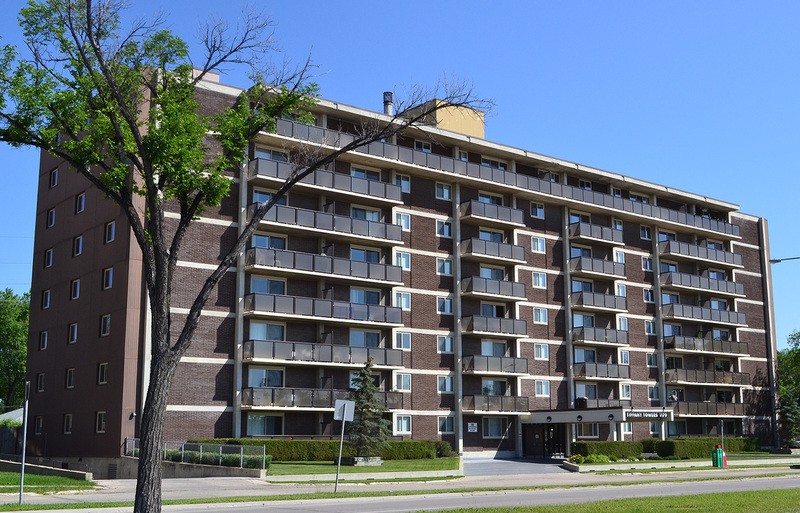 The building is safe and clean and in one of the most beautiful areas of Winnipeg.
" I really enjoy living here "
The on-site caretakers continuously keep everything running smoothly and always have time for a smile and a hello. Moving here was a great decision and Shindico made it effortless!!
" An ideal location to meet your needs "
Tiffany Towers is an ideal location for whatever your needs may be. Grant Park Mall is right across the street for one stop shopping, or if you choose to venture out, there is a bus stop right in front of the building. Shopping, dining and all the amenities and services you need are conveniently located nearby. Tiffany Towers is directly across from Grant Park Shopping Centre with Canadian Tire, Co-op Food Store and numerous other retail stores. Dine out at one of the many great restaurants within walking distance or enjoy a movie on the big screen located right across the street. Additionally, within easy reach is Grant Park Festival and Grant Park Pavilions, featuring a Walmart Supercentre, Sobeys, Starbucks, Subway and Boston Pizza and many other popular retail establishments.